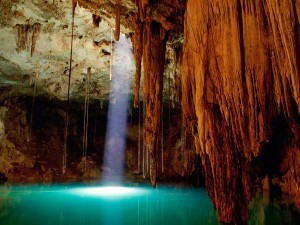 The ancient Mayas thought of the cenotes as entrances to the spiritual underworld. In 1904 the famed sacred cenote, housed by the acheological site Chichen Itza, was dredged and over 100 human skulls were found. Does this mean cenotes were used in sacrificial rituals or were they simply utilized as burial grounds? History can tell us a lot but this is one question that may remain unanswered indefinitely. The link between the Maya and the cenotes are not the only primordial connection. 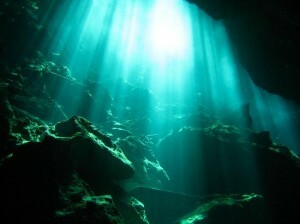 Cenotes were thought to be formed during a meteorite impact, more specifically, the same impact thought to be associated with the distinction of the dinosaurs. Putting the thought of dinosaurs, sacrifices and burial grounds aside, because that was thousands of years ago, cenotes are now a nature lover’s paradise. 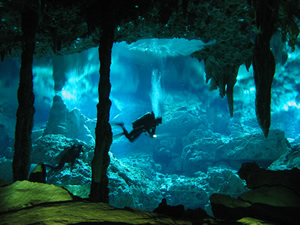 Filled with clean, crisp and clear groundwater, cenotes are host to a wide array of marine life. Every year, hundreds, if not thousands of divers and snorkelers come to the Yucatan Peninsula just to experience the beautiful underwater environment. If you have ever visited a cenote, you already know. Their beauty is indescribable. From above, you can see directly to their limestone bottom and from inside you are immersed in an underwater world with clear visibility of the stunning underwater environment in which you are surrounded. 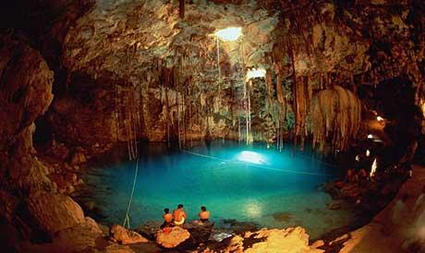 In addition to diving and snorkeling, cenotes are used as swim holes, a place where tourist and locals alike go to cool off. They are better than a pool and clearer and calmer than the nearby Caribbean Sea. Just jump in and refresh.